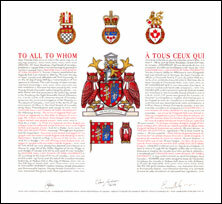 The design within the border was granted to Osgoode Hall Law School by the English Kings of Arms in 1958. The column, scroll and beaver appear on the seal, from 1823, of the Law Society of Upper Canada, which created and operated Osgoode Hall Law School until 1968. The beaver is a Canadian symbol, and the column represents Magna Carta as being the central pillar of the English legal tradition. The quarter of the shield with millrinds is the coat of arms of Lincoln’s Inn, one of the Inns of Court in London, England, to which William Osgoode, the first Chief Justice of Upper Canada and the school’s namesake, belonged. 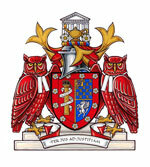 The quarter of the shield with the pegasus is the arms of the Inner Temple, the Inn of Court to which John White, Upper Canada’s first Attorney General, belonged. The border indicates Osgoode Hall’s affiliation with York University, the coat of arms of which uses a white rose, the royal badge of the House of York, on a red background. The portico refers to the original home of the law school at Osgoode Hall on Queen Street in Toronto. The lamp symbolizes learning. The white roses refer to York University. The owl, a symbol of wisdom through its association with Athena, has been the name of Osgoode Hall sports teams for many decades. The barrister’s bands are part of the formal courtroom attire for Canadian lawyers. Red and white are the colours of York University. The steps refer to the original Osgoode Hall and to the idea of knowledge as a process of stepping up. The three steps also allude to the three-year study of an undergraduate law degree. This Latin phrase, meaning “Through Law to Justice”, reflects the goal of legal education. The announcement of the Letters Patent was made on October 22, 2016, in Volume 150, page 3150 of the Canada Gazette. Original concept of Charles Smalley-Baker (c. 1958, Arms, Crest and Motto) and Bruce Patterson, Deputy Chief Herald of Canada (2015, Supporters, Flag, Badge and additions), assisted by the heralds of the Canadian Heraldic Authority.